Variable-Shape Conveyor offers 30, 45, and 60° angles. August 8, 2006 - Offered in rigid-side and flex-side styles, Multi-Flex VSC can be assembled into 8 conveyor types to transfer product between different elevation patterns. Discharge height can be altered with 7.5° adjustable tilt discharge from frame section. Frame sections permit random repositioning, and drive and tail pulley location can be reversed to meet changing needs. 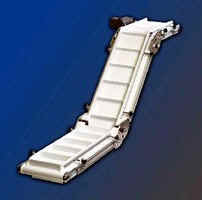 Conveyor provides positive automatic tracking through transition zones with self-cleaning, virtually wear-free V-guide.